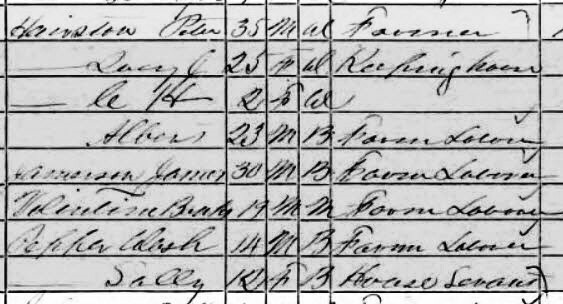 HAIRSTON - Col. Peter HAIRSTON Jr.
Census 1900* He appeared on the census of 23 June 1900 in Martinsville, Henry County, Virginia. Obituary Death of Col. Peter Hairstone. ROANOKE. Va.. March 14. --- Col. Peter Hairstone. who resigned from West Point to become a Confederate soldier, died yesterday at Martinsville. He was seventy nine years old. Coli Hairstone commanded the 24th Virginia Regiment and was wounded six times in battle. Colonel Peter Hairston, one of the most widelt known and prominent citizens of Henry county, died on Friday morning at his home near Martinsville following an illness with pneumonia at age 79 years. The deceased was eductaed at the United States Military Academy and the University of Virginia. He entered the war as a lieutenant and rose to the rank of colonel. He was severely wounded at Williamsburg, but refused to remain away from his command, continuing his military service until the close of the bloody drama. He was an uncle of Mayor Robert Hairston, of Reidsville. Mayor and Mrs. Hairston attended the funeral and burial Saturday. Col. Hairston held many positions of honor and influence and was prominently interested in the public affairs of the county, and as a leading spirit of the Stuart-Hairston Camp, always took an active part in movements pertaining to the Lost Cause. Col. Hairston was at one time a valuable member of the Board of Visitors to the Virginia Military Institute for which duties his West Point training fitted him so well and for some years he served his county as a member of the State Legislature and in other prominent positions. In his quiet home life, befitting a Virginia planter, he was most hospitable and genial and always the ideal host. Years ago he married Miss Lou Jones, of Appomattox county, Virginia who preceded him to the grave by ten years and without children. His wife was a sister of Mr. Robert Hairston's mother. His adopted daughter, Mrs. T. A. Rauson, resided with him. The funeral services and interment took place Saturday morning from the home of the deceased. [S3039] List of Cadets Admitted Into the United States Military Academy, West Point, N.Y., From Its Origin Till September 1, 1886., William Ward, Government Printing Office, 1887. [S139] National Archives - CSA Records.